In the 60s, his father bought The Elms farm in Brinsea Road, selling off the farmhouse, which is now a nursing home, and George set up a dairy farm. He lived with his mother in Silverstone Way until she died in 1980. In 1981 he built a farmhouse on his land and lived there for many years, selling off most of the land on retirement. After his health deteriorated, he moved to Stonewell Grove. In his younger days, George played football for Congresbury, until in his twenties he suffered a badly broken leg after a tractor accident. 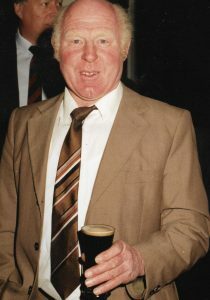 He played billiards for Congresbury, and captained the Memorial Hall skittles team for over 30 years. For many years, he was a member of Congresbury Bowling Club. George is survived by his identical twin Donald, younger brother Brian, and four sisters. A memorial service will be held in St. Andrew’s church on Tuesday, June 6 at 1.30p.m., after a family cremation.